It is love at first sight when Emma Dean first sets eyes on Mire House, which she has inherited from a distant, previously-unknown relative. She moves in and soon discovers there is more to the house than meets the eye: the dirty black suit hanging in the wardrobe, and the old man that obviously owns it who she finds standing at the end of her bed on her first night in the house; the muddy footprints that keep appearing in the hall; and, most disturbing of all, the bench in the neighbouring church yard that overlooks the house and is inscribed with the legend "My God, my God, why hast Thou forsaken me? Matthew 27:46". Is the house really, as it seems, haunted, or is it all the work of Charlie, a young man her own age who should have had a stronger claim to Mire House? As we step back through the history of the house, it becomes clear that it is a cursed place, and in gifting it to Emma, Clarence Mitchell may well have had an ulterior motive. With her third novel, Alison Littlewood returns to the realms of horror that we find in her debut novel, A Cold Season. What at first seems like a straightforward haunted house story takes dark and sinister turns as we learn the history of Mire House and the woman for whom it was built. The story opens in 2013, with Emma Dean inheriting the house from a relative she didn’t know she had. As soon as we see the house, we can feel that there is something wrong, though Emma herself seems completely captivated by it. There is something malevolent here, a sense that the house knows what it wants (look at the colour of the living room through the different eras, for example), and that the people that have died here in the past are still present. We return to Emma at the end of the novel, with a better understanding of what is happening and, more importantly, why. Between these two bookending sections, we pay visits to the house in 1973 and again during the final stages of its construction in 1939. Frank Watt, a young boy of eleven, is our guide for the former section, while Frank’s mother, Aggie, takes over the reins for the latter. As we proceed backwards through time, we unpeel the history of Mire House as if it were the layers of an onion. Rumours and supposition give way to harder facts: in 1973 we meet Mr Owens, the owner of the dirty black suit that Emma finds hanging in her wardrobe, and catch more substantial glimpses of the lady in the black veil. In 1939, we meet the lady in the black veil while she is still alive, and learn, first-hand, the terrible history behind the curse on Mire House. The three stories are cleverly intertwined in a way that gives us the information we need as we progress back through history, but still holds enough back to ensure maximum impact for the final reveal. It’s a beautifully-constructed tale that grabs the reader from the very first glimpse of Mire House, and carries us along – uneasy and, let’s be honest, more than a little bit frightened – for the duration. Alison Littlewood once again proves that she is a master (mistress?) of the quiet school of horror. Her writing is pitch perfect, the language changing according to the time period, her ability to induce a bad case of the heebie jeebies in the reader second to none. The Unquiet House feels partly like an homage to Susan Hill’s The Woman in Black – the big old house bordered by marshland; the cemetery; and, perhaps most telling, the woman in the black veil and her terrible history. Far from a reworking, or retreading of the plot, though, The Unquiet House is a beast of an entirely different species: stripped of all the finery, it’s a haunted house novel and, despite the presence of the ghosts, it is the house itself that instils the greatest fear in the reader. It’s a haunted house novel by a writer of exceptional skill (I’ve said it before, but it does bear repeating) that stands alongside the greats of the genre: fertile ground worked by the likes of Shirley Jackson, Richard Matheson, Stephen King, against whose seminal works Alison Littlewood can hold her head high. 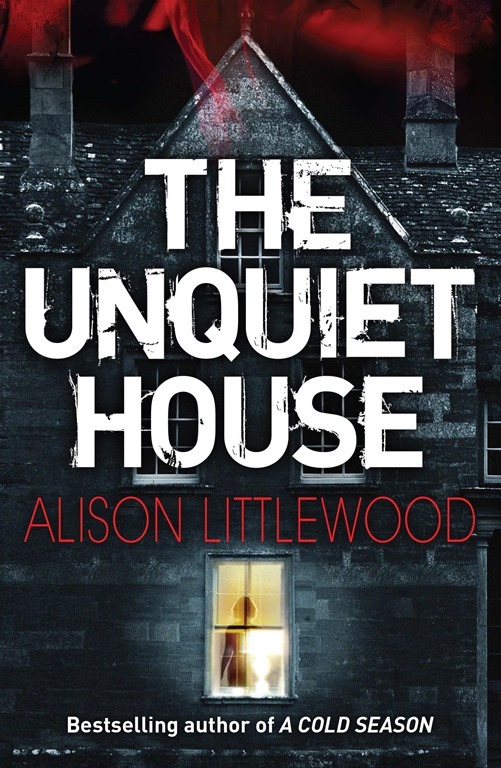 Returning to the quiet, creepy horror with which her debut novel was suffused, Alison Littlewood’s third novel, The Unquiet House, is the work of a writer whose talent continues to grow with each novel. She has an exceptionally clear voice, a distinctive style that, coupled with an intuitive understanding of which buttons to press and when to get the reactions she wants from the reader, makes each new book an unmissable event. If you haven’t jumped on the bandwagon yet, I suggest you do so sooner rather than later: you’re missing one of the most exceptional horror authors of the current generation.